It all has started once again as Samsung is preparing to launch its flagships next year and we are getting new leaks and details every new day. There have been a lot of leaks related to the Galaxy S9 and S9+ like the renders, specifications etc. 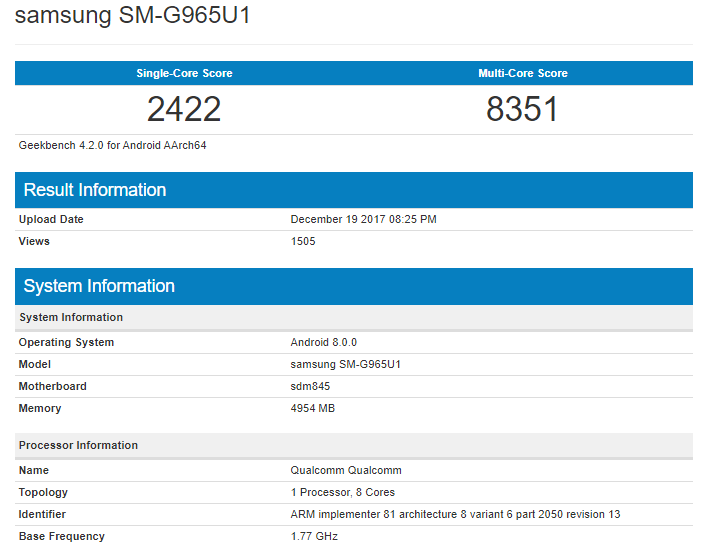 Today, however, the Samsung Galaxy S9+, which is the bigger of the two, was spotted on popular benchmarking platform Geekbench which finally revealed the Snapdragon 845 Geekbench scores since this chipset will power both S9 and S9+. Listed with the model number SM-G965U1, the phone has scores 2,422 on Single Core and an impressive 8,351 on Multi-score that is so far the highest score for any ‘Android’ smartphone. Still, it seems the Snapdragon 845 is not as powerful as the Apple’s A11 Bionic Chip that scores 4K+ on single core & 10K+ on Multi-score. But, we all know that Benchmarks tell only half the story. It’s all about the real world usage that tells how well the phone performs. The Geekbench listing has revealed 6GB RAM, Octa-Core Snapdragon 845 Processor & Android 8.0.0 Oreo running straight out of the box. So, what do you think of the Geekbench scores of the Snapdragon 845? Do let us know via the comments section.